One of the millions of things that I love about my journey in essential oils is that it brought me closer to God. My team, and my community, place HIM at the front and center, and it’s so cool that I’ve found a community of people who pray for success, and acknowledge how important faith is in our business. We’re doing this 21 Days of Prayer series in one of my oily groups. It’s so wonderful. Monique McLean is a wonderful leader in Young Living, and She’s the one leading it. You should follow her on all the social media for her joy, humor, and faith! Wowza. I love this verse! Savor Devotional by Shauna Niquist. It reminds me of sitting down for dinner with an old friend and receiving grace and Jesus. Jesus Calling Devotional. This came highly recommended by a friend, and so far, I’m enjoying the way in which it is written. 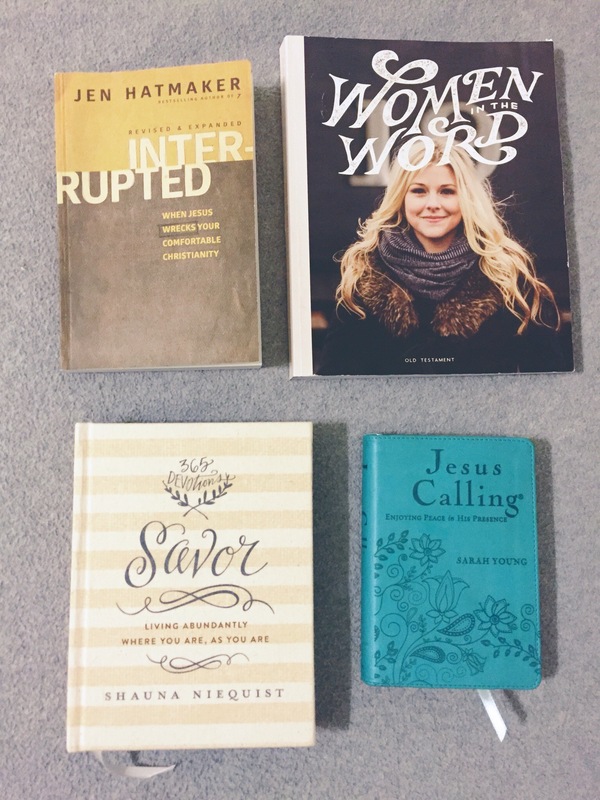 More Christian Books! Currently reading Interrupted by Jen Hatmaker. Jen is hilarious AND this book is wrecking me chapter by chapter. Examine my relationships and make sure that they only build up my relationship with Christ, don’t make me unglued, and make me a better being. Continue preparing for marriage with Andrew and to remember Christ as the center.